MANILA, Philippines - (Updated May 16) The Civil Service Commission(CSC) announces results of March 18, 2018 Civil Service Exam - Paper and Pencil Test (CSE-PPT) also known as Career service examination. 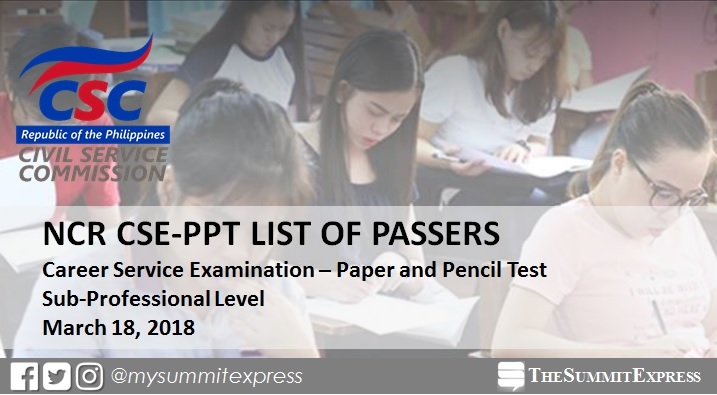 The full list of passers for Metro Manila or NCR sub-professional level exam is available online on May 16 or in 60 days after the test. CSC said that the bulk of examinees are from the National Capital Region.